The G2G 8mm I Joint is now available for use on standard and laminated glass, further enhancing our range of dry joints for use on internal glass partitions. G2G® is manufactured using a glass-clear polymer that provides superior clarity when compared with standard PVC dry joints designed for internal glass partitioning. 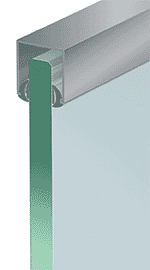 The profiles high bond tape incorporates a removable dust shield and achieves excellent adhesion between glass and profile. The G2G® range features 10 different dry joints including an innovative door seal system to allow a full range of design options. The range is completed by the frameless wedge gasket, a clear flexible wedge that grips the glass in slim aluminium head and base channels. To view the full range or to request samples click here. To ensure the best bond between the G2G® dry joint and the glass we suggest that the polished edges are clean, dust and grease free. It is recommended you ask your glass supplier to cut 0.5mm smaller on the flat edge than is stated for fit and function purposes. It is ok to have a smaller flat edge; a larger flat edge than stated can cause the joint NOT to bond. For standard glass panels of 8mm the polished flat edge of the glass should be cut to a maximum width of 4.5mm.